KCCC is looking for people from the community - residents, businesses and municipal governments - who support our efforts to preserve the historic beauty of Kyoto to join our forces. Your membership fee goes directly to funding our projects. 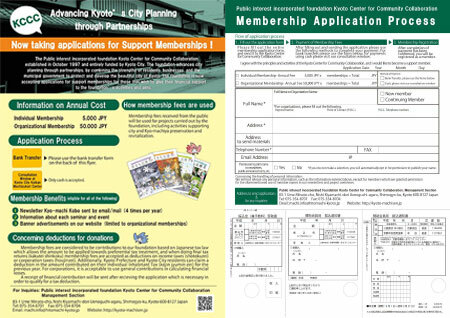 Members receive the KCCC newsletter, project announcements and special invitations to symposiums, workshops, etc. ■ Now taking applications for Support Memberships! Preferred invitations to symposiums, workshops, etc. ■ To become a member contact us.